The SQA Advanced Certificate and SQA Advanced Diploma in Chemical Process Technology give learners knowledge in subject areas related to chemistry and chemical process technology, providing the building blocks for a career in chemical process technology. 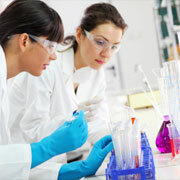 Areas covered include organic chemistry, physical chemistry, chemical engineering principles, and physics. Learners have the opportunity to develop practical skills in a laboratory environment, and to complete units that reflect specialisms in the chemical process industry. The SQA Advanced Certificate in Chemical Process Technology is designed to articulate with the SQA Advanced Diploma in Chemical Process Technology. SQA Advanced Certificates and Diplomas can provide progression to degree-level study. The SQA Advanced Certificate in Chemical Process Technology may allow direct entry into the second year of degree programmes and the SQA Advanced Diploma in Chemical Process Technology may allow direct entry to the third year of degree programmes. For further information please refer to SQA’s progression partners. SQA Advanced qualifications may also provide the knowledge and understanding required for related Modern Apprenticeships, eg the Modern Apprenticeship in Chemical Process Engineering and Related Industries.